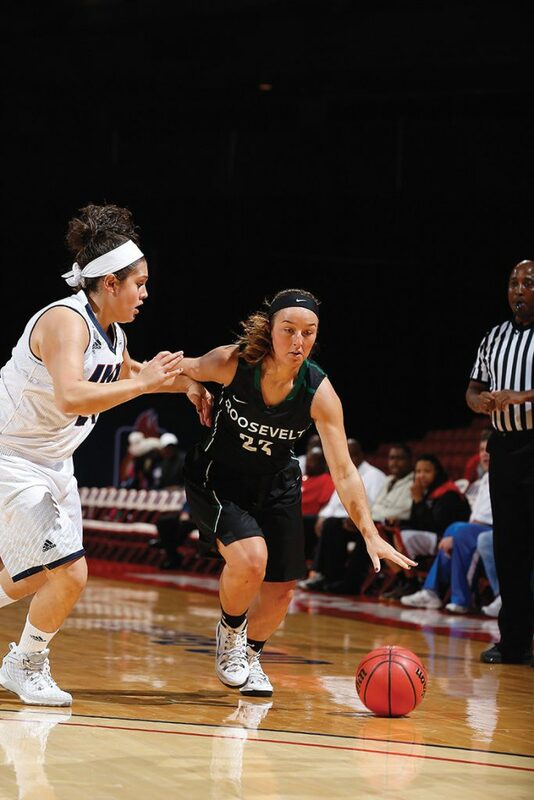 Unusual circumstances affected the Roosevelt women’s basketball team two weeks before the start of the 2015-16 academic year. Robyn Scherr-Wells, the head coach of the Lakers for the previous five seasons, left to take the same position at Davenport University in Grand Rapids, Mich. That left the Lakers without a head coach for the first time since 2009 and it forced Athletic Director Mike Cassidy to quickly find a replacement. Fortunately, he found a woman with a passion for basketball that was balanced with a life perspective molded by some time away from the game. Just 28 years old when she was named head coach last September, Keisha Newell had established herself as a gritty leader and hard-working offensive catalyst while playing point guard for Loyola University Chicago from 2007-10. After graduating, her leadership and nose-to-the-grindstone work ethic immediately landed her a position on Loyola’s coaching staff, where she helped recruit top-tier talent locally and across the country in an effort that led the Ramblers to one of their best finishes in program history in 2013. In 2014, Newell stepped away from the NCAA Division I coaching grind and became a student-athlete recruiter in the admissions office at North Park University on Chicago’s northwest side. While at North Park, Newell (née Collins) started a family after marrying former Simeon and Ball State standout Anthony Newell and giving birth to the couple’s first child, a son named Kamryn. It was during this time away from coaching that Newell sharpened her approach to using basketball as an opportunity to teach “big picture” lessons, and it made the Roosevelt job an attractive position when she was ready to get back into coaching. “I definitely learned a lot from my experience on the outside,” Newell said. “It’s more than just basketball. It’s about sticking to basic principles, being good women and good citizens.” Don’t get her wrong. Newell likes to win. But winning is a bit broader in her mind. Winning involves getting results and achieving them with two bedrocks on display: respect and hard work. Fortunately for Newell, the cupboard wasn’t bare in terms of good players and good people to instill such values when she arrived on campus. Roosevelt’s student-athletes had trained on their own until the hiring of Newell was made official. They played pickup ball, lifted in the weight room and stayed close during the summer to make sure they didn’t miss a beat when their new coach took over. 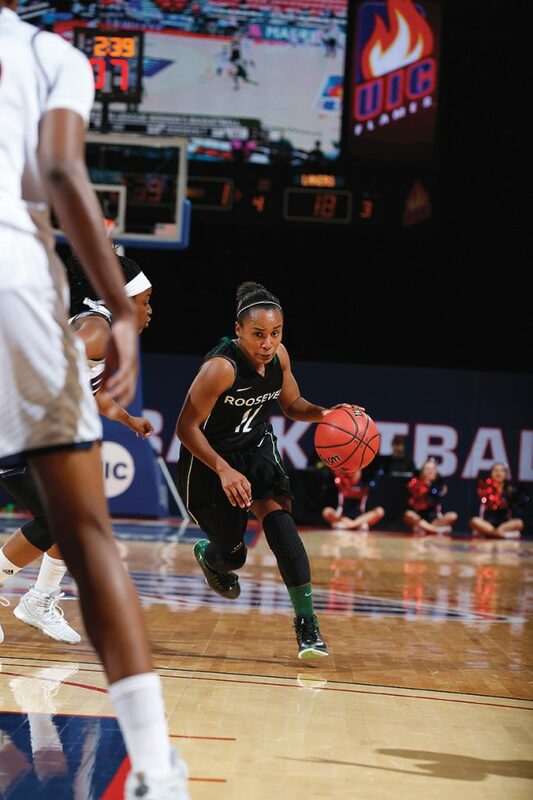 Led by senior point guard Becky Williford, a captain who has earned many accolades for her work on and off the court, this year’s Lakers were ready to prove to Newell and themselves that last year’s rough 8-win campaign was a confluence of difficult circumstances. Paige Gallimore averaged a team-leading 16 points per game. With that buy-in and trust in a new staff, things clicked early for the Lakers. Roosevelt won its first three games and won nine, more than last season’s total all year, before Christmas. Wins became tougher to come by near the start of a new calendar year due to a grueling schedule, as seven Top 25 opponents provided stern test after stern test. In the end Roosevelt qualified for the eight-team CCAC Tournament with 15 victories, nearly double that of 2014-15, before bowing out to regular season champion St. Francis (Ill.). Those accomplishments were “unbelievable” in the context of how the school year began, and Newell was even prouder with how the group achieved them.